The word “advent” (the arrival of an important person or thing) is derived from the Latin word “adventus,” which means “coming.” For Catholics, Advent is the four-week season leading up to Christmas. During Advent we anticipate the coming of Jesus. It’s a time full of reflection, excitement, and hope. Below is a list of various resources that will help you and your family enter into this Advent season more prepared for the true meaning of Christmas. What Is BEST ADVENT EVER? It’s a free email program that will help you slow down and focus on what matters most during this busy season. You’ll experience Advent in a whole new way—leading to the best Christmas of your life! Sign up HERE. Get a daily 2-3 minute video this Advent featuring amazing religious sisters (Sisters of Life, CFR Sisters, SOLT Sisters, DLJC, Nashville Dominicans and more.) Videos and reflections are short and engaging. Sign up HERE. 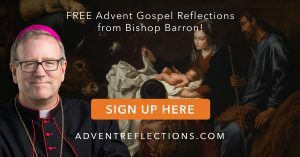 Spend your time with Christ in the Gospel this Advent alongside Bishop Barron and the Word on Fire community. FORMED is a web-based formation series produced by the Augustine Institute and Ignatius Press. This resource is designed to help all family members grow in their faith at all levels – how we think, how we pray, and how we live. And it is FREE! To access FORMED please click HERE.